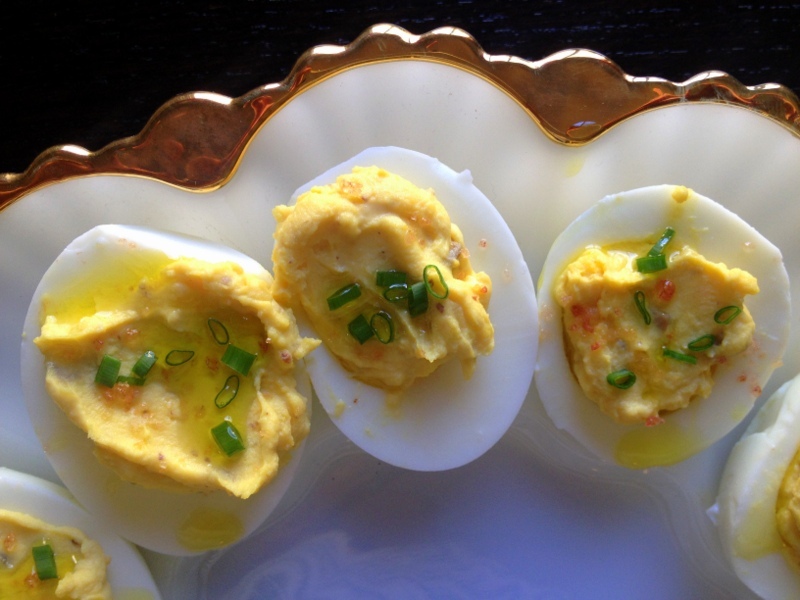 Whether you’re trying to use up the last of those Easter eggs or you’re looking for a crowd pleasing party snack, try our recipe for a sophisticated twist on classic deviled eggs. Peel the hard boiled eggs and slice in half lengthwise. Scoop the yolks into a medium a bowl and combine with mayonnaise and mustard. Work the mixture until well incorporated and smooth. Taste and season with salt and pepper. Using a small spreading knife, scoop about a tablespoon of the mixture into the empty egg white and smooth with the back of the knife. Repeat with remaining eggs. Garnish the eggs with a sprinkling of chives and sea salt and a drizzle of extra virgin olive oil. *We love a robust, grassy olive oil which stands up to the richness of the eggs. We also like a sea salt that has a coarser grain and gives the eggs a nice bit of crunch.